Despite the prosecution accusing Daryl "Taxstone" Campbell today in a Manhattan federal court of murdering Ronald "Banga" McPhatter," the victim of the last year's Irving Plaza shooting, the popular podcaster has been granted $500,000 bail and should be home on house arrest within a week if he meets all the requirements set forth by the judge. The 31-year-old host of the podcast "Tax Season" was arraigned this afternoon, not on charges of homicide, but on felon in possession of a firearm and on transporting and receiving a firearm. Tax' entered the lower Manhattan court today wearing the same black tie-dye shirt he was arrested in yesterday morning (January 16) at his aunt's home in Brooklyn. Tax' mostly sat silently next to his lawyer Kenneth J. Montgomery who also represented Bobby Shmurda for a while in his well-publicized conspiracy and weapons case from 2014. "Yes, sir," were Taxstone's only words when asked by judge Andrew Peck if he understood his rights. Most of the proceedings today centered around whether or not the opinionated media personality would be granted bail. U.S. Attorney Hagen Scotten asked that Campbell remain in custody because, besides being a flight risk, Taxstone was a "danger to the community." And in the most damning of the Scotten's accusations, he claimed Taxstone was the shooter who wounded three people, including Troy Ave, and killed Troy's friend and security McPhatter at the infamous Irving Plaza incident last May. The prosecutor said Tax "shot the fatal shot" and his DNA is on the murder weapon used in the Irving slaying. He also brought up Taxstone's sordid past as a very young man that included gang activity, over 20 arrests, and two convictions -- one for gun possession and one for attempted robbery. He used Taxstone's own words against him citing threats he levied towards Troy Ave on his own podcast. "When I see you walking up with six dudes, bang-ba-ba-ba-ba-ba-ba-ba...," Scotten quoted Taxstone as threatening. When asked by the judge why it has taken so long for Taxstone to be arrested since the May shooting, Scotten said that his team took time to conduct a thorough investigation, analyze DNA, and seek witnesses. Tax's lawyer, Kenneth Montgomery, countered, saying the majority of his client's arrests happened prior to him being 23 years old and that Taxstone has "walked down the path of redemption" and "changed his life around." 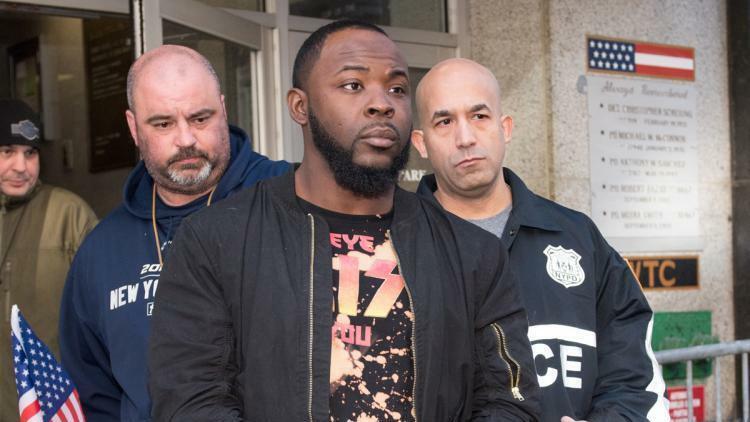 Montgomery also argued that since the Irving Plaza shooting, Taxstone has traveled across the U.S., as well as abroad, on business and has always returned home to Brooklyn, thus he is not a risk to flee authorities. Montgomery also made a bizarre revelation that a "S.W.A.T team" came to Taxstone's house on January 3, knocked on the door, but did not make an arrest. McPhatter nor Troy Ave's names were actually said in court, but both prosecution and defense referred to Troy as "individual one." Montgomery brought up that Ave also "has DNA on the gun in question"; the murder weapon was in fact found in one of Troy's vehicles and he was still granted bail by the state. Scotten said that Troy might have been better off not receiving bail and cited the recent Christmas Day attempt on the rapper's life in Brooklyn. After hearing both sides, Judge Peck made his decision. "I'm taking a chance on you, Mr. Campbell," he said. Besides the money that has to be ponied up, Taxstone will be placed on house arrest and must adhere to drug tests and wear an electronic monitor. He can leave home to go record his podcast and meet with his lawyer, but any other leave must be work-related and approved by the court. "He should be fine, barring the government appealing the decision by the judge," Montgomery said to REVOLT TV after today's proceedings. Taxstone is due back in court on February 16 and Montgomery says his client isn't taking his legal battle lightly. "He's a very sharp and well-balanced individual," Montgomery said. "And he understands the gravity of the situation he's in."